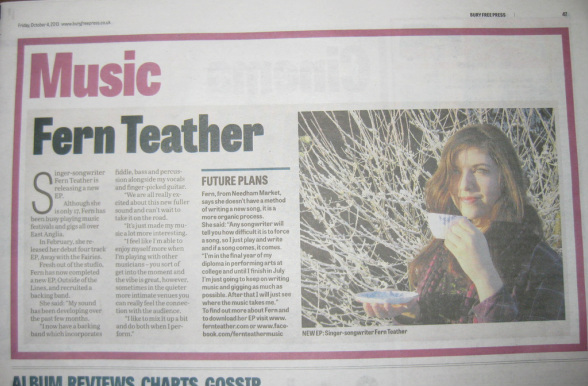 Singer-songwriter Fern Teather is releasing a new EP. Although she is only 17, Fern has been busy playing music festivals and gigs all over East Anglia. In February, she released her debut four track EP, Away with the Fairies. Fresh out of the studio, Fern has now completed a new EP, Outside of the Lines, and recruited a backing band. She said: "My sound has been developing over the past few months. I now have a backing band which incorporates fiddle, bass and percussion alongside my vocals and finger-picked guitar. We are all very excited about this new fuller sound and can't wait to take it on the road. It's just made my music a lot more interesting. I feel like I am able to enjoy myself more when I'm playing with other musicians - you sort of get into the moment and the vibe is great, however, sometimes in the quieter more intimate venues you can really feel the connection with the audience. I like to mix it up a bit and do both when I perform." Fern, from Needham Market, says she doesn't have a method of writing a new song, it is a more organic process. She said "Any songwriter will tell you how difficult it is to force a song, so I just play and write and if a song comes, it comes. I'm in the final year of my diploma in performing arts at college and until I finish in July I'm just going to keep on writing music and gigging as much as possible. after that I will just see where the music takes me."